Hawthorn 73 class teaches students to organize, run charity efforts | Handing H.O.P.E. 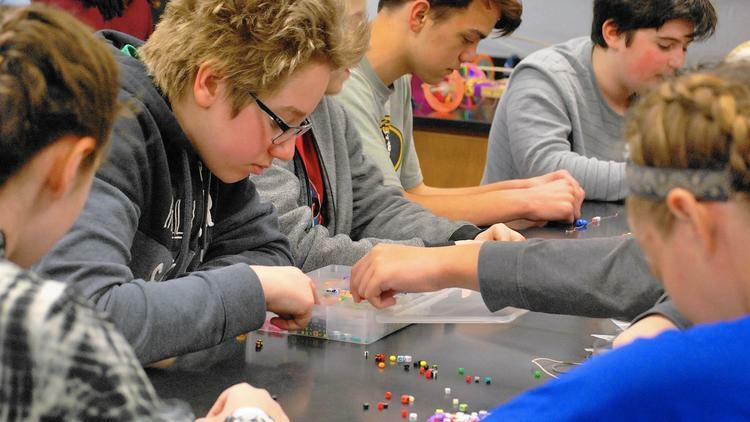 As part of a pilot program, a group of eighth grade students at Hawthorn School District 73 built a business plan for their own charity and soon will be sending a supply of bracelets and lollipops to juvenile cancer patients. The program involves a new class called “integrated math and science.” Teacher Mike Sementa from Middle School South said the class, which only has two sections, is more like an entrepreneurial studies class. Students had to choose a cause they support, review possible ways to help, select a profitable project, create a budget, build a schedule and execute the whole thing. The group set a goal of raising $3,000 from lollipop sales by May 15, Sementa said. By April 7, they had collected about $3,500 through corporate donations and lunchroom sales, Sementa said. Through networking with nonprofit “Handing H.O.P.E.” Hawthorn’s money will make “lollipop trees” for juvenile cancer patients at Advocate Lutheran General Hospital in Park Ridge, Sementa said. On certain days, the two classes work on making baggies filled with string, beads and other items that can be used to make bracelets. Eighth grader Tory Jordan said the project is a lot of work, but worth it. The choice of causes was something personal for the class. “Those words might not mean much right now, but when you’re always tired and scared, they have mean a lot more,” Hart said. Sementa said the class is actually a high school-level curriculum.